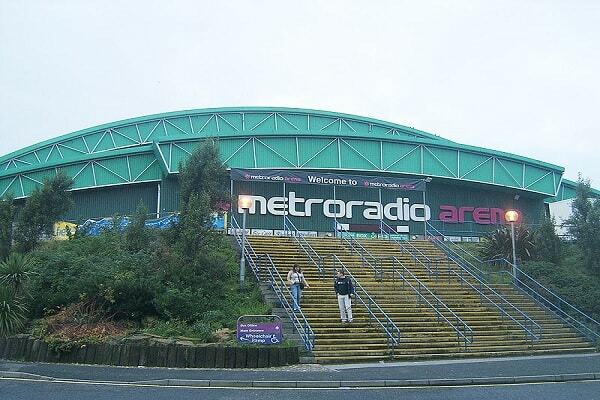 Metro Radio Arena (formerly the Newcastle Arena and Telewest Arena) is a sports and entertainment arena in the city of Newcastle upon Tyne, North East England, United Kingdom. Owned and operated by the SMG Europe and sponsored by Metro Radio, it hosts music, entertainment, sports & business events. Having also had various professional basketball and ice hockey teams as tenants for much of its history, since 2009 it has had no ice hockey team after the departure of the Newcastle Vipers to the Whitley Bay Ice Rink, and no basketball team since the departure of the Newcastle Eagles to Northumbria University's Sport Central arena in 2010. According to SMG, the open span arena is the largest concert and exhibition venue in the north east. It has 40,000 square feet (3,700 m2) of exhibition and conference space. For concerts, it has a seating capacity of 11,000 and more, while for basketball it can seat 6,500 an ice shows, 5,500. The arena has been used since 1997 to host an annual Convention of Jehovah's Witnesses. Local worshipers, as well as some from as far North as the Scottish Borders, South as North Yorkshire and West as Maryport, on the West coast of Cumbria flock for the 3 day event in June, around 7,000 attend in total. Other sporting events hosted by the arena have included Nations Cup snooker, Davis Cup tennis and world championship boxing.